There was a dead squirrel in the road this morning. It had been run over, a broad, shallow trough left by the tyre across its back. From the look of its legs the squirrel had been stopped in mid dash; it had played the game of chicken once too often. Such a game would be second nature to the grey squirrel. It has its own special brand of lunatic daring, leaping from branch to branch and tree to tree, sometimes across six feet or more of empty space. Occasionally it has to scrabble madly to stay on, or desperately abandon its grip and aim for another, safer, branch lower down. And once in a while it makes a complete mess of things and misjudges altogether. Then there is nothing to do but go loose and, crashing earthwards through the twigs and branches, hope the ground isn’t too hard below. One squirrel I saw fall hit the ground with a thump that made me wince, but the leaf litter was fairly thick and the animal, though a bit dazed, soon recovered and seemed none the worse. They have a trick of keeping the tree trunk between you and them, slowly circling as you circle, coming back again, sometimes peeping out to see where you’ve got to. There is good reason for them to fear human beings, but dogs – which are never known to carry guns – are treated with impudence. Labradors in particular seem to get very excited when they see or smell a squirrel. The chase ends at a tree: the dog, barking loudly, tries to make itself taller, while the squirrel, having selected at leisure a comfortable fork some ten or fifteen feet up, sits back and virtually thumbs its nose. 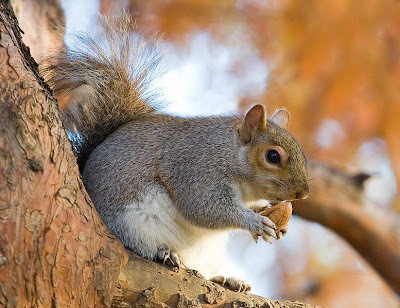 The grey squirrel, even before the rabbit, is our most familiar mammal. It has adapted so well to the English countryside that one easily forgets that it, like the rabbit, is an introduced species. Whereas the rabbit was brought here by the Romans, though, the grey squirrel has only been with us since 1876, when four were brought from America and released in Cheshire. From then until 1929 there were fifty-two introductions at various places up and down the country, totalling a mere 247 animals in all. From these few the whole of our present stock is descended. By 1971 the grey squirrel was to be found in all but three of the counties of England and Wales. It is a fairly safe bet that, wherever an introduced animal thrives, it turns out to be a pest. The grey squirrel is no exception. It has plainly found life here to its liking, and a glance at a government report on squirrels tells us why. The staple diet of nuts, mainly acorns, hazelnuts, beechnuts, and chestnuts, is varied, in autumn, with the pick of the wild fungi, corn from the farmers’ ricks and fields, and the choicest fruits, both wild and in the orchard. By Christmas, bulbs and buds are at their best. In February, swedes, parsnips and turnips are coming into season, and March sees the start of the freshly sown wheat and barley. Squirrels may be practising vegetarians, but they are not faddists and will not refuse a meal of juicy insect larvae or pupae, or of birds’ eggs or nestlings. In suburban gardens at least, so fond are they of eggs that they will gnaw through a heavy-gauge aluminium plate guarding the entrance hole of a wooden nestbox. The egg season, alas, is soon over, and by late June the squirrels must make do with strawberries, cherries, plums, and, on into July and August, pears, peaches, and whatever they can find in the way of ripening wheat, oats, and barley. The main fault held against the grey squirrel, though, is its taste for the sweet sap in the cambium layer of tree bark. Young trees between ten and forty years of age are most at risk, especially during the spring and early summer. The tree is usually scarred or distorted to some extent, and if the bark is gnawed off in a ring the tree will die. In some areas the damage is costly and severe. Although the grey squirrel is popularly believed to have driven out the native red species, the truth is more complicated than that. It seems that the grey squirrel arrived at a time when the red was declining anyway – through disease, perhaps, and certainly through destruction of habitat. The two species will coexist peacefully for many years where they are found together, and in some places the red squirrels died out long before the grey ones arrived. Where grey squirrels are well established, however, they may prevent red squirrels from recolonizing. There is no question of the grey squirrels systematically killing the red, although it is certainly true that, on very rare occasions, individuals of the two species will fight, sometimes with fatal results for the smaller and lighter red squirrel. The red squirrel is the more attractive animal, but if it had to go then the grey squirrel is an appealing enough replacement. Despite the most strenuous efforts at control, including a bounty scheme, the grey squirrel continues to thrive. If you are not a farmer or fruit-grower or forester, that will not seem such a bad thing after all.